It is probable that Japanese officials felt relieved by these Tweets, since Trump has been so unpredictable in his comments on Twitter. During the campaign, he had commented several times that Japan should spend more money for the US Forces in Japan. 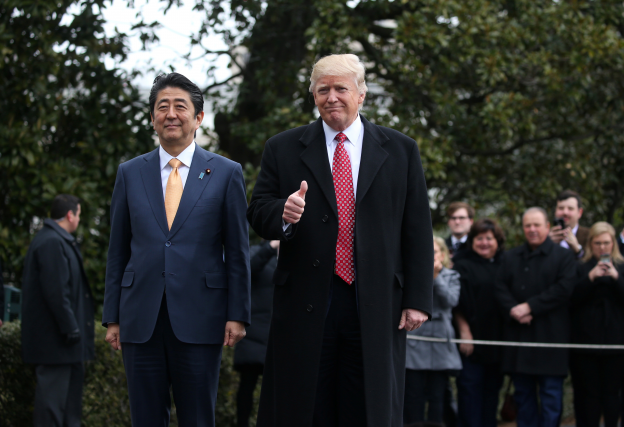 After the inauguration, the first task that Abe needed to do was to receive reassurance of the importance of the US-Japan alliance from a new president. Japan’s geopolitical environment is severer than that of many American allies in Europe. It is surrounded by nuclear powers—China, Russia, and North Korea—and it has territorial problems with both China and Russia. These strategic situations necessitate that Japan firmly retain its alliance with the United States. Furthermore, the American military presence in East Asia has been one of the most important foundations for the stability in this region. In brief, Japan does not have a credible alternative to its strong alliance even though the newly elected US president has criticized some aspects of the alliance. To maintain the liberal international order, the leading powers need to respect the rule of law and multilateral international institutions. Trump shows little interest in either of them. Abe needs to collaborate with new president despite considerably different understandings of the future of the international order. This means that Abe needs to adjust to the new politics He successfully used his time playing golf with Trump to narrow the gap in their visions of the future international order is what Japanese have concluded, at least as it applies to the East Asian region in which Japan is situated. The most important issue for the Japanese government was whether the new US administration would commit to existing treaty obligations. Japan managed to get what it wanted in the Japan-US Joint Statement issued on February 10, which states, "the two leaders affirmed that Article V of the US-Japan Treaty of Mutual Cooperation and Security covers the Senkaku Islands. "9 The two also affirmed that "they oppose any unilateral action that seeks to undermine Japan’s administration of these islands. "10 This is the first time that a US president wrote down in an official document that the Senkaku Islands are covered by Article V. In April 2014, President Barack Obama orally gave this assurance without documentation. In this respect, the alliance has been enhanced under Trump. A week before the summit between Abe and Trump, Abe met Defense Secretary James Mattis at the Prime Minister’s Office, and they talked for 50 minutes. During the conversation, Mattis stated that the Senkaku Islands are in the territories under the administration of Japan, and are within the scope that is covered by Article V. Mattis also made clear that the United States opposes any unilateral action that seeks to undermine Japan’s administration of these islands.11 This conversation became a stepping-stone for the fruitful summit meeting between the two leaders a week later. It seems that US treaty commitments in the Asia Pacific are more certain than its commitments in Europe through NATO. We can see more continuity than change in security policy toward the Asia Pacific, partly because American interests are larger in this region than in other regions. To protect its own national interests, Trump’s administration needs to use alliances in this region as a tool to multiply its influence. However, there still exists uncertainty and unpredictability in US security policy towards the Asia Pacific. US alliances cannot be the same under Trump as before. The Institute for International Policy Studies (IIPS), a leading Japanese policy think tank, published policy recommendations, which proposed that Japan should strengthen its defense capabilities by increasing the level of defense expenditures from the current 1.0 percent to 1.2 percent of GDP in order to respond effectively to the changing security environment.12 "Self-help" will be more necessary for American allies than before to maintain strong alliances with the United States. The Japanese public welcomed Abe’s approach to a new US president. According to a public opinion poll by Yomiuri Shimbun (February 17-19), the support rate for Abe’s Cabinet reached 66 percent—an increase by 5 percent over the previous month.13 66 percent of respondents answered that they positively evaluated his meeting with Trump, and only 26 percent answered negatively. Unlike in many European countries, Japanese voters understand the importance of good relations with the United States, regardless of who is in the presidential office. Abe is now expected to stay in the office until 2020. During his premiership, it is probable that the Japanese government will issue new National Defense Program Guidelines, which should correspond to a new American security strategy towards the Asia Pacific. So far, there are no clear signs that the new US administration will present a radical break from the previous regional strategy. However, the Japanese government continues to watch the direction of US security policy carefully. It would not be unthinkable that some new approaches by the Trump administration would cause unexpected turbulence in international politics in the Asia Pacific. Japan cannot easily imagine an alternative to its alliance with the United States. If the alliance should be weakened, it would cause undesirable damage to the regional strategic balance. As long as Trump recognizes that "The unshakable US-Japan Alliance is the cornerstone of peace, prosperity, and the freedom in the Asia-Pacific region," as is written in the US-Japan Joint Statement of February 10, Japan can continue to rely on its alliance partnership with the United States. 3. "Trump and Abe hit it off during round on Florida golf course," The Japan Times, February 12, 2017, http://www.japantimes.co.jp/news/2017/02/12/national/politics-diplomacy/trump-abe-hit-off-round-florida-golf-course/. 4. The White House, "Remarks by President Trump and Prime Minister Abe of Japan in Joint Press Conference," February 10, 2017, East Room, https://www.whitehouse.gov/the-press-office/2017/02/10/remarks-president-trump-and-prime-minister-abe-japan-joint-press. 5. Motoko Rich, "Relief in Japan After Shinzo Abe’s Visit With Trump," The New York Times, February 13, 2017. 6. Abe appeared on "Prime News" of Fuji Television. He talked with Sorimachi Osamu, TV anchor, for about 20 minutes on his meeting with Trump, http://www.bsfuji.tv/primenews/movie/day/d170213_0.html. 7. Cabinet Secretariat, National Security Strategy, December 17, 2013, http://www.cas.go.jp/jp/siryou/131217anzenhoshou/nss-e.pdf. 8. Stewart M. Patrick, "Trump and World Order: The Return of Self-Help," Foreign Affairs, March/April 2017, 52. 9. Ministry of Foreign Affairs, Joint Statement, February 10, 2017, http://www.mofa.go.jp/files/000227768.pdf. 11. Ministry of Foreign Affairs, "Prime Minister Abe Received a Courtesy Call from US Defense Secretary Mattis," February 3, 2017, http://www.mofa.go.jp/na/st/page3e_000644.html. 12. Institute for International Policy Studies (IIPS), “The Trump Administration and Japan: Challenges and Visions for Japan’s Foreign and Security Policy in the New Era,” January 2017, http://www.iips.org/en/research/usjr2017en.pdf. 13. Yomiuri Shimbun, February 19, 2017, http://www.yomiuri.co.jp/politics/20170219-OYT1T50080.html. 14. "Abe defends close Trump ties; opposition calls him a ‘chicken,’" The Asahi Shimbun, February 15, 2017.